CITY OF INDUSTRY, CA--(Marketwire - November 19, 2008) - DXG USA (www.dxgusa.com), one of the fastest-growing digital camera companies in the U.S., announced today two festive, affordable and fun high definition (HD) camcorders with special holiday pricing and accessories. 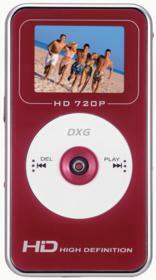 The brand new DXG-579V is the upright, HD star with 720p video capture and a five megapixel camera, which is available at Kohl's. The DXG-567V comes in three playful colors, is the most compact HD camcorder on the market, and is available at Wal-Mart. With its holiday value packs of camcorders and accessories, DXG brings consumers the most affordable products for capturing HD video and the best ideas for gift giving this holiday. To complete the holiday value pack, both products come packaged with a portable tripod, 2 gigabyte SD card for capturing up to two hours of HD video, ArcSoft TotalMedia Extreme video editing software (a $99 value), protective pouch, rechargeable batteries and charger, and AV cables for viewing video on TV. The DXG holiday bundle promotion begins Friday, November 28, and runs through December 31, or while supplies last. "This holiday season, more than any other, consumers are looking for ways to maximize their dollar yet not sacrifice quality or cool," said Paul Goldberg, senior vice president of sales and marketing for DXG USA. "DXG is known for delivering the best value high definition camcorders on the market, and our two holiday bundles give consumers the highest quality video, essential accessories, and prices under $200." 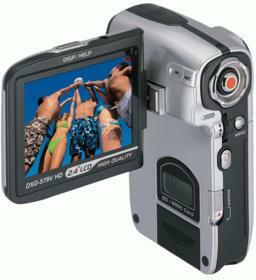 The DXG-579V is one of the most fashionable camcorders today, with a vertical form factor and a large 2.4" rotation screen that makes following and filming your subject a snap. The DXG-579V records H.264 video (.mov file format) at 720p up to 1280 x 720 at 30 frames per second, and features digital voice recording. The DXG-579V also captures still pictures up to 8 megapixels, can support High-Capacity SD cards, and comes in midnight black and classic silver. The DXG-567V is a video blogger's dream, connecting directly to the computer with a retractable USB connector and uses Rapid Blog Manager Application software for quick uploading of video to sites like YouTube. Incredibly compact and functional, the DXG-567V also records 720p HD video, fits easily in a shirt pocket, and comes in red, blue and black. Both the DXG-579V and 567V make it easy for consumers to upload videos to YouTube and other online video sites, an important activity for consumers today. Both products also ship with free ArcSoft TotalMedia™ Extreme software which lets you create, edit and watch movies and video on a whole new level with two unique applications: TotalMedia Theatre™ and TotalMedia Studio. The DXG-579V holiday value pack is available at Kohl's and the DXG-567V value pack is available at Wal-Mart, starting Friday, November 28, through Wednesday, December 31, or while supplies last. Both products are bundled with the camcorder, tripod, 2GB SD card, rechargeable batteries and charger, protective pouch and AV cables. More information on DXG and its products is online at www.dxgusa.com. DXG USA, The Digital Camera Company, is one of the fastest growing digital camera manufacturers in the U.S., providing intuitively designed digital cameras and camcorders for the youth and mainstream markets. Compact, fashionable and affordably priced, DXG digital cameras are setting trends for quality and utility. DXG USA is a fully owned subsidiary of DXG Technology Corp., one of the world's leading manufacturers and designers (OEM/ODM) of digital cameras and camcorders. DXG Technology has won numerous design and innovation awards and employs more than 4,000 people worldwide. Complete information on DXG USA can be found at www.dxgusa.com.